What's missing in this picture is the knife that belonged in the empty slot as circled. This is sorta an all points bulletin that if you've found a misplaced knife in the past....where did you find it? I might find it in the same place. Thereof the set of knives won't remain incomplete. Again, I don't necessarily purchase kitchenware based on price alone. Although higher prices usually denote better quality material used in a given article's manufacture, there's also feel and asethetics that factor in and of the final product. Hey, I bought the "Tools of the Trade" knife set on sale several years ago already and I haven't had any regrets about the purchase. However, I would prefer the knife set to remain complete. I'll eventually pass it on to my sister as an heirloom item and as overwhelmed as she'd be as the recepient of, the knife set should have all parts intact. It's just the idea. So I decided to give the knife block a bath. So I put the knife block in the oven to thoroughly dry it out. 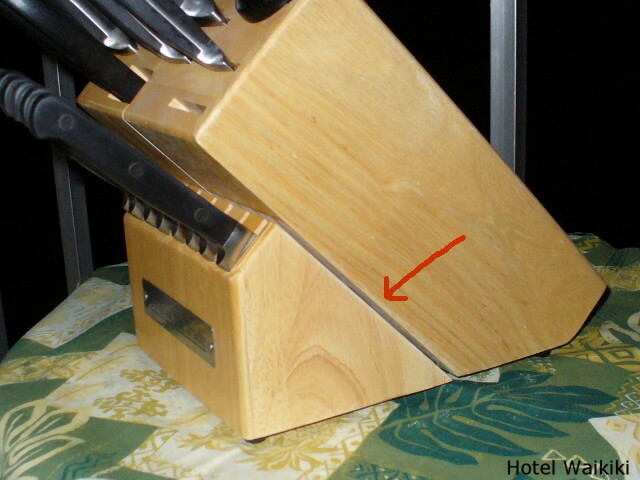 Did you know that they make knife blocks out of wood? And did you know that if you set the oven temperature just a few degrees to hot, the wood block, or more accurately, the sub blocks will start to separate from one another leaving behind a gapping crack at its seams? No, you can't reverse the process. It simply don't work that way. That said, I'm leaving it in situ. That means, as it is. That way it'll fit in and blend well with my all stainless kitchen. Household items such as these aquire themselves sentimental value with each new nick and scratch endeared to them throughout their years of service. Rowena- looks like you survived the Thanksgiving bash at your house. 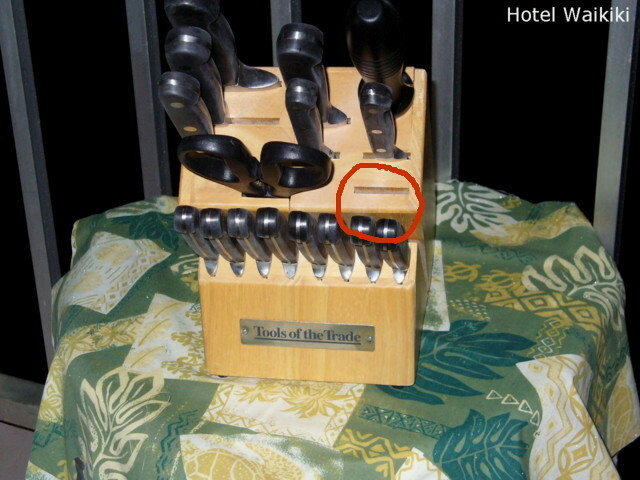 Yeah, the knife block a little too big to balance on the lanai railing.